Stories are how we make sense of events in our lives. We string together a narrative so that life doesn’t seem entirely random. In some situations, this is essential—it’s a fundamental aspect of human nature to seek meaning. We are a society that creates stories so fast we don’t even know we’re doing it. Yet our minds don’t limit story-making to those times when it’s helpful for us. We all tell ourselves and others stories all the time. Often, those stories create pain—and they’re not rooted in fact. Once I learned to observe my thoughts, I began questioning them: Is this true? Facts are the “what is” of the situation. Interpretations and judgements are the story we create around the facts. These can be positive or negative. Negative stories, perhaps obviously, create pain and inner turmoil; positive stories make us feel good, except (just as with the negative) they’re not true. And that sets us up for future pain. Using one of Rosenberg’s examples, let’s look at a very common story: “She’s selfish.” The observation, in this case, is that “she takes care of her own needs.” He even claims that there’s a culture in which no word exists for ‘selfish’ because ‘caring for one’s own needs’ is considered normal. How radical is that? Our interpretations are possible, but as Byron Katie says, it’s always—always—possible to find another interpretation that is equally or more true. In general, we talk about how people connect through shared stories. In this definition of the word, however, stories create separation between ourselves and others, even when our interpretation is positive. Even if we experience an event that makes us feel like we’re #winningatlife, that’s a story. The fact, as Rosenberg would say, is that—like all humans—we have a need for recognition, and in the moment of that event, our need was met. Storytelling is, literally, what I do professionally. A list of facts is pretty boring to read. I spent decades writing personal essays that turned fairly mundane facts into compelling and often humorous stories. I’d write about how hilarious or awful or bizarre various situations were. I’d pass judgments on them—often to great effect. There’s even a book (an excellent one) on writing essays and memoir called The Situation and the Story. The two are entirely distinct. The story is what our minds tell us about the situation. When I work with memoir writers, one of the first things I discuss is that memoir is not about the events of a story, but rather, the emotional journey underneath. After I went off medication, I began seeing how spinning facts into stories caused me pain, especially when I believed I was being ignored, or that people didn’t like me, or that something bad was going to happen in the future. I stopped writing essays for three full years, in order to train my mind away from creating stories out of facts. It was such an automatic behavior for me that I needed a time-out. I needed to learn, in Rosenberg’s words, to observe rather than interpret. Let’s say we’ve tried to make plans with a friend three times, and each of those times, she has cancelled (fact). We might interpret that as, “She doesn’t want to see me.” And while it’s possible that that’s true, that story creates pain—and it isn’t necessarily true. She might have had deadlines, or her child might have been sick, or her brother came to town unexpectedly, or her husband was abducted by aliens—the point is, without asking directly (and trusting that we’re getting an honest answer), we can’t know for sure. Why torture ourselves about something we can’t know? Because, ego. The ego likes to feel separate and superior, and nothing creates separation and superiority more than passing judgment on another person or situation. Even putting ourselves down is a form of ego. We’re passing judgment on our own behavior, or on the essence of who we are and deeming it to be unworthy. Who are we to do that? Social self-deprecation assumes that we’re so awesome that others will inevitably feel bad about themselves if we don’t put ourselves down. While genuine humility is a good thing (she said, making a judgment), as is being considerate (another judgment), we’re not responsible for the reactions of others. This process is what helped me reframe ADHD. Rather than believe the story, “I procrastinate” (which I had done for years), I looked at the facts of what was actually happening: “When I’m not interested in something, my attention moves to something else that does interest me.” There’s no value judgment in there. People are as they are in this moment. They will likely behave differently in a different moment. Things are as they are. Situations change, because that’s the nature of life. We live in a culture of nonstop stories, and in many ways, those stories are important; they help us find meaning in the world. Yet stories, judgments and interpretations can turn the mind into a torture instrument. By learning to separate facts from stories, we can find immense peace. We learn to accept people and situations as they are in this moment, because by removing the story, we remove the emotional charge. When we stop with the stories, drama ceases. The key to stopping the stories is accepting what is, as it is, and not feeling—consciously or subconsciously—that it should be any different. This can be really, really difficult. The ego loooooooves drama. It keeps us focused on what’s different about us vs. others, rather than on the commonalities. Facts, Eckhart Tolle says, are always empowering. The situation is what it is. This is what needs to be accepted. If I have $5 to my name, then that’s a fact to accept. It doesn’t mean accepting “this is how it will always be, and I’m a total failure” (you might recognize that as a story). Only when we can accept the facts can we take effective action to change the situation. It’s the difference between reacting to a story and responding to a situation. There was a period of time when I was able to separate facts from stories pretty consistently, and honestly, I also found it difficult to operate in the social world. Most jokes stopped being funny. Outrageous things, weren’t. Irony? Gone. I felt immense peace, yet I also felt like I didn’t belong on this planet. Stories, as Robert McKee says, are the currency of human contact. So the key is to find a balance. Learning to separate facts from stories takes practice, and pretty consistent practice at that. As with anything, it’s much easier to see when other people are creating stories than when we are. 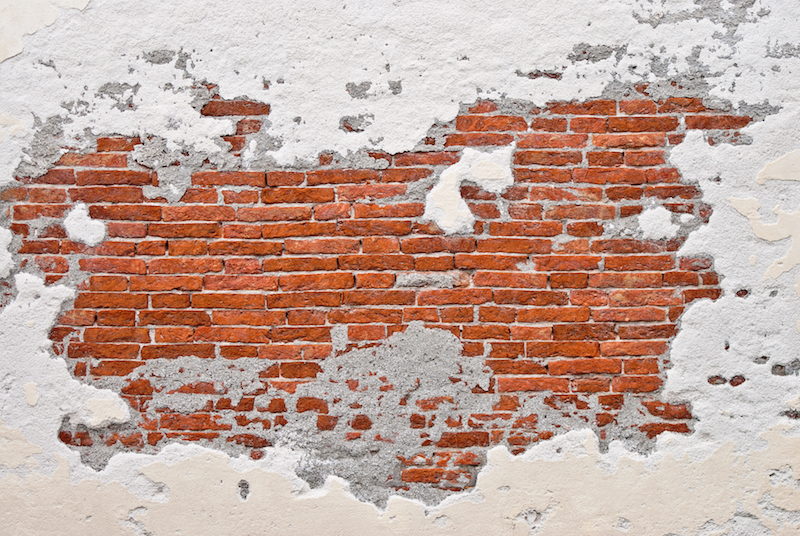 But over time, we can learn to go beyond the surface story—metaphorically, the plaster of the photo above—to the facts, or bricks, underneath. One way to start is to notice when we’re feeling a strong emotional reaction, either positive or negative. Once we start learning observe thoughts, we can ask, what are we telling ourselves that’s giving rise to that emotion? Is that a fact, or an interpretation? Instead of looking for a different interpretation that will make us more comfortable, what if we could just sit with the facts as they are?